Shift Labs developed DripAssist – a fast, accurate Infusion Rate Monitor that easily clips onto any gravity drip set to continuously monitor flow rate and volume when administering IV medications. 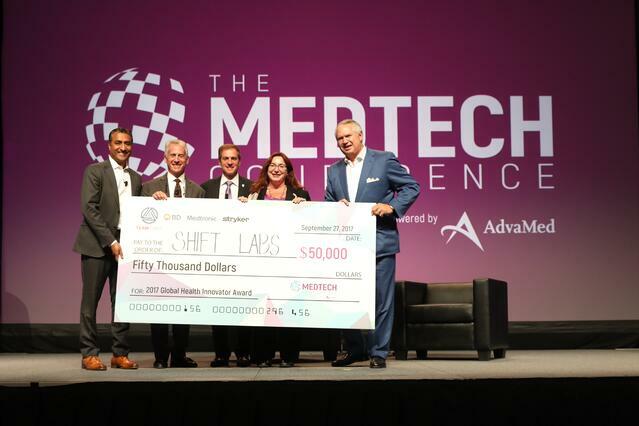 As the winner of the Global Health Innovator Award, Shift Labs will receive $50,000 to help them bring their Infusion Rate Monitor to the men, women and children in developing nations. Technologies like DripAssist can have a significant impact for the billions of people worldwide living in low resource environments - those without ready access to affordable health services, medical staff, supplies or equipment. With continued investment and an ongoing dialogue on the challenges, successes and lessons learned as we relentlessly work to deploy medical technology solutions, we can prevent millions of deaths and help to alleviate the burden of diseases and chronic conditions in developing countries. Learn more about Shift Labs here.